At this time of year indulgent eating and drinking kind of becomes a sport for Renato and I. I mean we have already been to our first official holiday party of the season, then there was my big 40th birthday party, and Thanksgiving is just days away. Aloha is a company that makes superfood and protein powders, they also have a great recipe section chock full of inspiring ideas. It was after surfing around there that I decided to come up with an appetizer that would be good for holiday cocktail parties but was still on the healthy side. 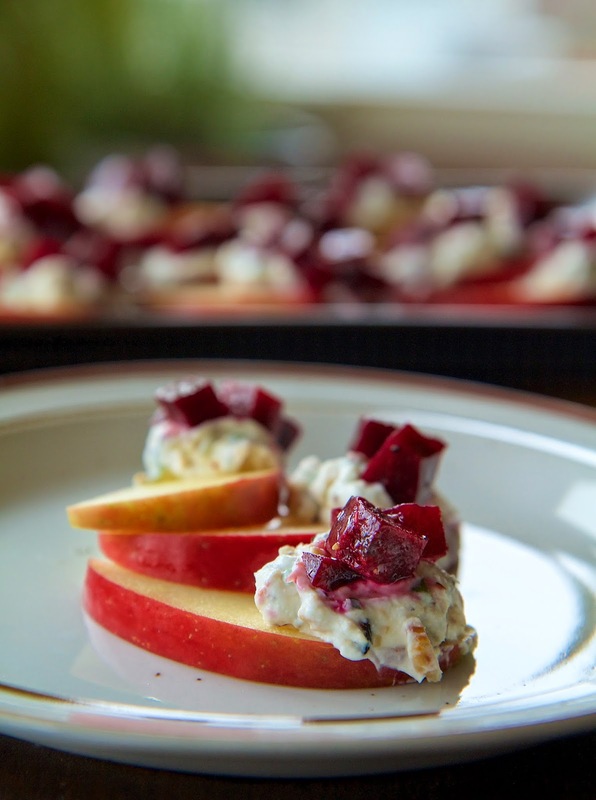 Consider these apple and beet bites my contribution to all the healthy holiday ideas out there. I think the key is balance. Indulge a little, but try to focus on healthier options. 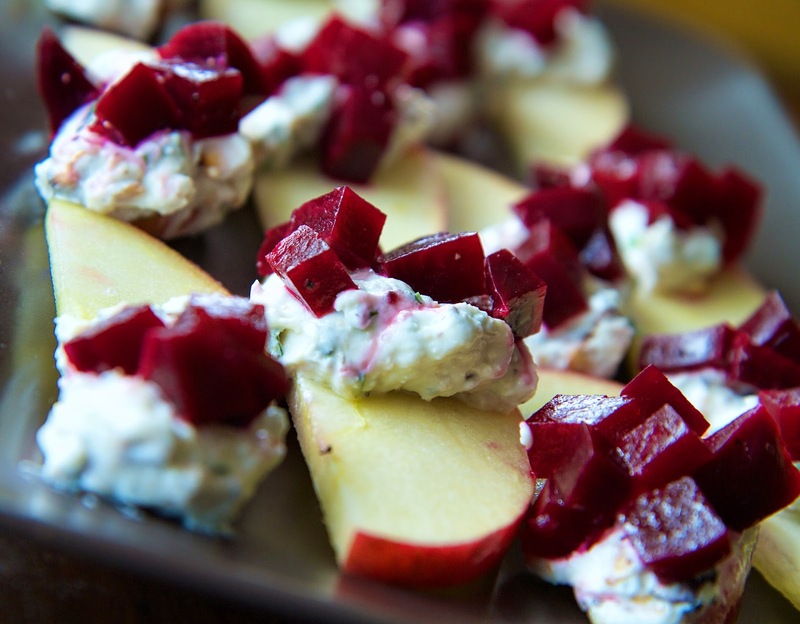 With a citrus-herb goat cheese, crisp apples, toasted nuts and roasted beets these little bites are packed with stuff that's good for you. They taste so good you won't feel like you're denying yourself of anything. Plus, they are easy to nosh on with one hand while holding a drink in the other. Preheat oven to 350 degree Fahrenheit. On a rimmed baking sheet toast hazelnuts in one layer in middle of oven 10 to 15 minutes. Wrap nuts in a kitchen towel and let steam 1 minute. Rub the hazelnuts in towel to remove loose skins and cool completely. Chop and set aside. Dice the roasted and cooled beets and place in a small bowl. Stir in cider vinegar, extra virgin olive oil, salt and pepper. Set aside. Whisk together the goat cheese and buttermilk until light and airy. Then, stir in the chives, thyme, maple syrup, clementine zest and toasted hazelnuts. Set aside. Cut apples into quarters, remove core. Thinly slice lengthwise. Toss in a large bowl along with the lemon juice to prevent browning. Put 1/2 teaspoon of the goat cheese mixture on one end of each apple slice. Top with some of the seasoned diced beets.